Christian Jolley scored the opening goal in Newport's 2013 Conference play-off final win against Wrexham. Grimsby Town have signed striker Christian Jolley and defender Gregor Robertson on a deal until the end of the season. 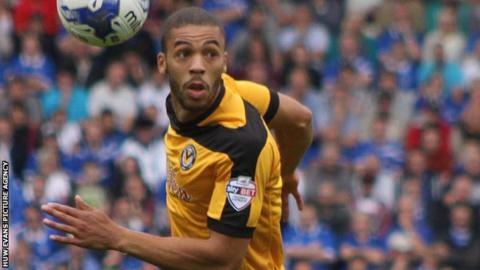 Jolley, 26, was released by Newport County last week after spending two years with the Welsh side. Robertson, 31, had his contract terminated by Northampton earlier this month after making 24 appearances this season. Both players could make their debut in Tuesday's trip to Eastleigh.